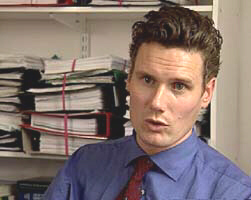 Keir Starmer on the trial, the judge and Dave and Helen's legal career. 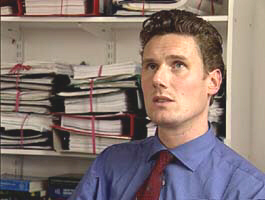 Keir Starmer is a progressive barrister at Doughty Street Chambers. He has represented tree-dwellers, road protestors, hunt sabateurs and even King Arthur Pendragon. He has written several publications on the legal industry. He has been working closely with Helen and Dave - for free - since the early days. 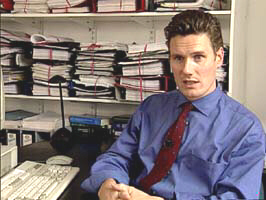 Keir Starmer was interviewed in 1997 by One-Off Productions for their TV documentary, McLibel: Two Worlds Collide. "You cannot have the longest case in civil history, and in all likelihood criminal history, where one side has a top legal team and the others have no resources whatsoever. Whatever the result, this case will change the future of libel law"
Could you start by describing your involvement in this trial? Well I've been involved from the start. I was asked to give some advice to [Dave and Helen] at the very beginning of proceedings and I've tried to help out since then - It's impossible in my view for anybody to conduct a case as complicated as libel without some form of legal assistance. I was able to help Dave and Helen and in fact the other defendants before they dropped out of the picture, by providing some legal services to them. Had they been able to get legal aid they'd have had proper representation throughout. How do you view the issues raised in the trial? The issues raised in this trial are complicated and important in two different senses. Firstly there's the actual details of the case itself - the allegations that are raised and whether they're true or not or whether they're capable of being proved. But perhaps more fundamentally, freedom of speech - to what extent ought people to be able to say what they genuinely believe is true and to be able to defend themselves in court. So far as the first issue is concerned there's a good deal of material in support of what Dave and Helen say in their case and to substantiate the arguments they've been putting in court. The problem has been getting that evidence with no resources to fly in witnesses, take detailed statements, etc. It's been extremely difficult, so far as the broader issue is concerned, it's very much a David and Goliath. There's an extremely good legal team acting for McDonalds at great expense and Dave and Helen have had to act for themselves with me as a sort of free back up whenever possible. You say that McDonalds have got a very good team. Could you describe the members of their team? Yeah, McDonalds have a top QC who specialises in libel. They have a junior counsel and they have a firm of solicitors who are well known for their libel work. So they have a top team with full expertise, and the weight of that team came down on Dave and Helen from the very start. They've been battling with that, because it's not just the days in court - the actual hearing, there's been all sorts of hearings before the case even started which have really ground [them] down and would have ground down anybody in their position. So how well do you think Helen and Dave have done? I think they've done brilliantly well. They've done what most people wouldn't have been able to do which is to stand up for the right to say what they genuinely believe to be true and to try to prove that in court and it's very important that they've done that. The imbalance in the libel laws, between those that have money and those that don't creates a real risk that criticism will be stifled, purely and simply because those without money cannot afford to stand up and try to prove what they say is true. From working with Helen and Dave, do you think they have a particular aptitude for this? I mean could anybody else have done this? I think they'll make very good lawyers when they've finished. I'm encouraging them to do that! Dave and Helen are a extraordinary couple in my opinion. When I first met them they really didn't know very much about the law at all, and they certainly didn't know very much about libel law. But they've worked away and grappled away with mountains of evidence and really difficult legal concepts and between them they form now a very good team. Their cross-examination is extremely good, some of the answers they've got out of the experts in court top barristers would have been very pleased to have elicited. But they've also managed to grasp very difficult legal concepts and now if we have a discussion about a point that's cropped up or we have to draft something, they're very quick with the arguments and they're able to draft stuff on their own, or argue it on their own, I think they'll make very good lawyers when they've finished. I'm encouraging them to do that! What about Richard Rampton, McDonalds' QC? Well Richard Rampton has had a much easier job than Dave and Helen for two reasons. One is that he's obviously extremely well qualified as a libel barrister, he's a QC, i.e. his expertise has been recognised and therefore a lot of the legal points that have arisen he will have dealt with before in his career. But secondly he has the natural advantage. The plaintiff in a libel action can simply say `you've slandered me, you've libelled me' and then sit back and wait for the defendant to try and prove what they've said is true. So his job has been relatively easy. He simply says `well I think this is libellous'. Dave and Helen then have to not only get on top of the same legal points as him, but put forward the evidence to support their case. So there's an imbalance which is very much in his favour rather than Dave and Helen's. I would say their job's been much much more difficult than his. In light of that, how well has he done? Has he done any particularly clever legal tricks or has he got any particularly good admissions? I think looking at the transcripts and seeing what I've seen of the proceedings, and listening to Dave and Helen, that Mr Rampton's done as well as could've been expected. [He] has obviously had a lot of experience of libel cases and has conducted this case in the way I am sure he would have conducted any other case, and he's won a number of legal victories along the way. Having said that, in terms of the evidence that's come out, I think Dave and Helen have done far better than him. They've gained more than he has in cross-examination. And in many ways he's a barrister with a case which he can't win, even if the judgement goes in his favour, nobody outside the courtroom is seriously gonna consider McDonalds to have been the victims, because of the huge imbalance between the resources of one party and the other, and the inability of Dave and Helen to get the witnesses they wanted there on the day they needed them. What about McDonald's changing their statement of claim? Yes, one extraordinary feature of the case was when Mr Rampton applied to change his case after the cross-examination of McDonalds witnesses on nutrition. Mr Rampton, on behalf of McDonalds, decided to fundamentally change the way in which he put the case and extended it by amending his statement of claim. Instead of now saying that they handed out the leaflet on one or two occasions, they're trying to make them liable for the entire production of the leaflet, anywhere in the country, over a three or four year period - even when not handed out or distributed directly by themselves. [Another] has been the extent to which McDonalds have been prepared to infiltrate the group London Greenpeace to find out information, and the full picture has only emerged as the case has gone on. And it's quite clear that McDonalds put spies within the group who were collating all sorts of information. It also emerged that those people were playing their full part in the group and were doing everything that it was alleged Dave and Helen were doing to promote the leaflet in question. The possible inclusion of the agents of McDonalds in the case raises very interesting legal questions ... it now emerges that their agents attended more meetings, participated more fully, and distributed the leaflet more freely than Dave and Helen ever did and on that basis the argument in law must run that McDonalds have not only consented to the distribution, but ought to be liable for any damages that they say they've caused to their reputation. "The inclusion of McDonalds' agents in the case raises very interesting legal questions ... it now emerges that their agents attended more meetings, participated more fully, and distributed the leaflet more freely than Dave and Helen ever did"
What impact has the counterclaim had on the case? The counterclaim's extremely important because it changed the focus of the case. Until [then] McDonalds were able to sit back and cast Dave and Helen in the role of the people in the wrong, the people in the dock who had to defend themselves and show that they were telling the truth. Once the counterclaim came along, McDonalds had to suddenly explain why it was they were saying that the leaflet was lies. In other words they had to explain that their business practices were not as described in the leaflet, and produce evidence to that effect. Now in some areas, for example nutrition, that had an amazing effect on the case and pushed McDonalds very much onto the back foot. The most important conclusion that can be drawn about the counterclaim is that McDonalds are now on trial for their business practices and the focus is less on Dave and Helen and more on them, and I think that's how the public perceive the issues. It's really whether McDonalds can now show that these allegations in the leaflet are unfounded, and if they can't they run a very serious risk in the public's eye. Could you tell us something about the judge. Apparently this is the first time he's ever done libel and he keeps referring to Rampton, asking him questions? "In many ways he's a barrister with a case which he can't win ... nobody outside the courtroom is seriously gonna consider McDonalds to have been the victims"
This judge has only recently been appointed and I think this was one of his first cases ... he must have been persuaded that it was a six week case and it's now turned out to be two years. It seems that he takes his lead from Mr Rampton, who after all is a leading barrister on libel, when legal issues arise, and I know that's caused difficulty for Dave and Helen because they obviously see Mr Rampton as representing one side, whilst they're on the other. Dave says that there's no way he could ever find for them because he is part of the system which McDonalds represents. I'm not gonna get a writ from the judge saying I'm totally corrupted!! - and I don't think it's necessarily true. ... I do think there's one point worth making though and it's this, that the stakes are now so high for McDonalds that if they lose on any one issue it's gonna be devastating for them because given their resources and given the arguments they've mounted they think they ought to win, and therefore if they don't then it really is devastating. My prediction is McDonalds'll win probably about three quarters, but there will be some significant points on which Dave and Helen win and that can be turned into a real victory for Dave and Helen on the basis that, you know, McDonalds ought to have won everything. Could you tell us a bit about what the inside view of the trial is, from the legal profession? The inside view on the trial in the legal profession is that this case shows the absurdity of the libel laws and that after this case things are going to have to change. You cannot have the longest case in civil history, and in all likelihood criminal history, where one side has a top legal team and the others have no resources whatsoever. So whatever the result this case will change the future of libel law. One insight that anyone can take from this case is how unfair the legal system can be in this country. We pride ourselves on having a legal system which is the best in the world and we pride ourselves on the fact that we've all got free speech, but in reality of course that simply isn't the situation. If you can't put up the money to run a case such as this then you really can't say what you like and it's the battle of those that can afford to run libel proceedings against those that can't - not the battle of truth that this case throws up. What have you personally gained from? How the hell am I supposed to say to that!! One of the most interesting aspects of this case, as far as I'm concerned, has been to watch and observe two people with courage fighting a case, and to see that even with limited resources, even unable to bring all the evidence you want to to court, you can win significant victories through a belief in what you're saying, a belief in free speech and the courage to continually put your case forward. And I've learnt a lot through watching Dave and Helen do that. How are multi-national organisations using the libel laws at the moment? Some would say they are using them to suppress criticism. The problem with the law as it now for libel is that it's not a battle for the truth in court, it's a battle of the purse. If you have the money you can hire a good legal team. If you have no money you can't hire a legal team and you run huge risks because if you lose you could pay the costs of the person that's suing you. Now that is a huge incentive by those that can afford to pay lawyers to suppress information and opinions of those that they know can't - and many people will withdraw from cases or settle cases because they fear the costs. 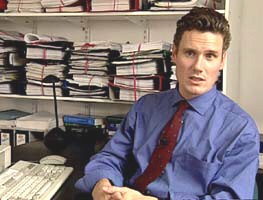 The costs of most libel cases would be in excess of fifty thousand pounds. Had Dave and Helen instructed lawyers on their behalf the costs would have clearly exceeded a million pounds. So do you think that multi-nationals should have the right to sue for libel? The absurdity of multi-nationals being able to sue for libel is that they don't have to prove their reputation is lowered. One can understand how an individual might be viewed differently by members of society if certain things are said about them, but a multi- national has only a trading capacity, and yet in this case McDonalds can sue for what they say is the lowering of their reputation, without having to prove or show that they've lost the sale of a single hamburger as a result of the leaflet being distributed. And in my view that is an unwarranted intrusion onto freedom of expression. It's very interesting to see that the courts have now recognised that government departments and local authorities can't sue for libel on the basis that it would stifle free speech. "It's important that the public are able to criticise McDonalds, or any other multi-national, and to do so freely, and I can't see that any multi-national genuinely needs to use the courts as a forum for getting its arguments across"
In my view the same ought to apply for multi nationals. They wield great power throughout the world, McDonalds is well known in many many countries and it's important that the public are able to criticise McDonalds, or any other multi-national, and to do so freely, and I can't see that any multi-national genuinely needs to use the courts as a forum for getting its arguments across. What will your role be in the closing speeches? The final stages of the case are obviously extremely important ... what has to happen now is the distillation of all the facts into a legal framework which is itself extremely complicated. There are only ten or so weeks for that process to take place and it's been necessary to try and bring together as many people as possible to work on the arguments, to pull lawyers in on a voluntary basis and ask them for their time and resources to help with this task. It is extremely important because it's obviously the way in which Dave and Helen are going to put their case in their final submissions to the court. In light of this, are they receiving much help from the legal community? Yes. It's a feature of this case that it's only been possible to bring together a team of legal volunteers at the very end. Before the case had so much publicity there were some very lonely days when the meetings were literally me, Dave and Helen, for months and months and months. It's very nice now to see that their battle in court has really grasped the imagination, not only of the public, but of lawyers, has pricked their consciences, and they've come along now to help with the preparations for the final speech. When the closing speeches have been made, what happens then? Once the closing speeches are finished the judge then has a very difficult task because he has to look at the submissions that have been made to him and consider the evidence and try to come to the right decision on all of the points that have been raised. Now he's bound to find on some points for McDonalds, and in my view he will find for Dave and Helen on other points, and when he's done that he's then got to decide if he's going to award any damages and if he does, how large an amount of damages he awards. Now clearly if he awards a huge amount against Dave and Helen it will bankrupt them and they wont have any prospect of paying them. If on the other hand he orders a small amount McDonalds will feel that their name hasn't been vindicated and that it was all a pointless exercise. So he has the very difficult task of getting the damages right as well as the verdict right. How much weight do you feel can be given to the verdict. I think very little weight can be given to the verdict. It really isn't to achieve very much, to win this point or that in a case when everybody knows other witnesses could have been called, and if you sit back and think about some of the witnesses that could have come on behalf of Dave and Helen, but didn't because nobody could pay their air fare. The verdict pales into insignificance, it's meaningless. If both sides had had all the witnesses they wanted there, then a true verdict might have been possible, but with the best will in the world the judge can only give a verdict according to the evidence and the evidence costs money and we all know as a fact that the money wasn't there for Dave and Helen to call the witnesses they wanted. And when the case ends? It's very difficult to predict what will happen when this case ends. I think it's unlikely that the verdict will see the end of the leaflet and because people genuinely believe in free speech and feel that this case has been an attempt to suppress free speech, there could well be mass defiance of the courts and the mass distribution of the leaflet. It's very difficult to see what McDonalds could do in that situation and very difficult to see what the courts could do faced with that situation. So it may be that in the end that free speech will win.